Pros: Works well as a fan and a heater at the same time. Built in temperature detection allows you to save money and keep the room temperature “just right”. Sleek and small design compared to other units. Has a lengthy power cable. Multiple fan, and heat settings. Fan allows heat to fill room rather than just make one area warm. The cabinet and grill is cool to the touch so you don’t have to worry about burning yourself as much. Has a Five year warranty. Fan only option is a welcomed feature. Cons: Cord does not have a ground. For bigger rooms you might want to turn the heat setting or fan up, but If the fan is turned to high mode, it is a slightly loud for a heater. 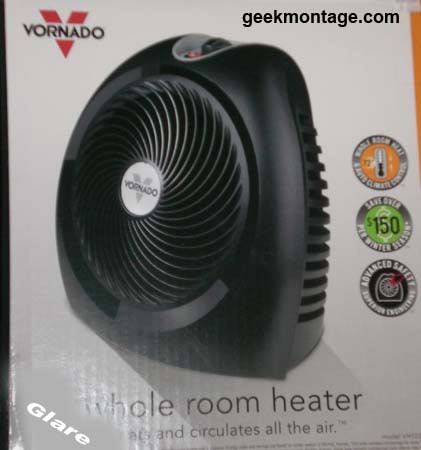 Key Takeaway: The Vornado VH103 is a solid heater and fan in one that will promise to keep you warm during the holidays and will still leave your wallet with some breathing room for buying Christmas gifts! I really wanted to get this review out when this product was given to me last month, but various reasons kept me from doing so. I was very adamant on getting this review out in time before it got much colder though. That is why I am writing this review for you all after hours. I hope it helps you all. I definitely am staying toasty right now because of this heater. A lot of people get much better sleep because of things like that. Don’t know what a BTU is? That is okay, I didn’t either. According to Wikipedia a BTU is. “The British thermal unit (BTU or Btu) is a traditional unit of energy equal to about 1 055.05585 joules”. So basically 1 kilowatt-hour (kWh) = 3413. Okay now let’s get to the good stuff. Here are some photos that I took of the packaging. It’s a similar to the packaging I received for the Vornado 733B. You will notice that both products advertise making a room one set temperature. And that is a good thing. That first picture had a glare that I just covered with some digital paint. As you can see I know my way around photoshop. The Vornado VH103/VH102 uses the same grill design as the cooling fans. Each strand of plastic comes from the center of the fan where the logo is and curves outward and then inward again to the left. This protects fingers, and circulates the air into a whirl-like motion. This whirl-pool like motion allows the Vornado VH103/VH102 to push air further. It also protects fingers! Vornado is known for one thing, and that is their fans. By purchasing this product, not only are you buying yourself a heater, you are getting a fan as well. This fan can be used with heat(if you have heat selected on the temperature dial), or without heat. So do not worry, whether it be heat or cool air, you will be able to move air across the room. Basically this product does not cast a glow when it heats. Older heaters would light up the area when they rose in temperature. Now we are at the controls of this little heater. 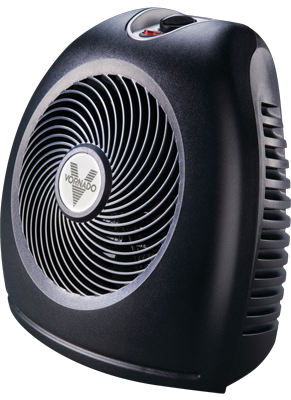 The Vornado VH103/VH102 has a simple interface with several powerful functions. You will see controls for High/Low Heat, Cont./Automatic Fan, an illuminated on(1) and off (0) switch, and finally, a twist temperature dial that goes from 65 degrees F, to 85 degrees F and even has a fan only option. You will see the photo of this interface just below the safety features. I would’ve liked more fan control but that is just me. 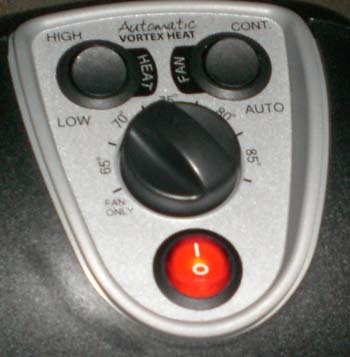 The heat option allows the fan to deliver continuous heat. Old heaters would turn themselves on and off and would not really care about the temperature of the room. This allows constant heat, constant power flow, and saves your wallet by not creating additional heat when it is not needed. Safety is very important when it comes to using heaters. You never know what can go wrong. Thankfully the Vornado VH103/VH102 features many safety features. You already know about the tight grill spirals that protect your fingers. You do not know about the cool touch case, the automatic safety shut-off system and the tip over protection, so let’s go over them. The entire case is cool to the touch. I have carelessly picked it up and touched it without getting hurt unlike my last heater that I would use to unthaw my fingers after a snowball fight. The automatic safety shut-off system will turn off the heat to the heater (sounds a little redundant) if the product ever gets blocked. So if you drop a couple blankets on it, you might wonder why your room just got so cold. Tip Over Protection is a big feature for this tiny product. If you tip your heater over, that could be a disaster for other heaters. Thankfully the Vornado VH103/VH102 will lower the power to the heating element and the fan itself so that it will not overheat. While all these features are welcome, it is still a heater. Handle this product with care. These safety features are designed to help you but do not rely on them. Additionally, we are not liable if anything goes wrong with your product. If you have any questions you should consult with Vornado, and they will gladly help you out. Okay now that I am done with all that safety stuff! 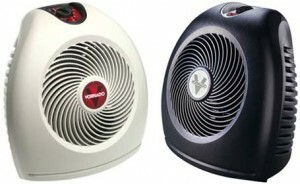 You can always count on Vornado to turn a basic thing such as a fan or heater into something completely advanced. All these features work well so all I can comment about is the fan. The fan won’t push air as much as a standard Vornado fan obviously, but this is a heater first, and then a fan. I am currently in a large room and the air is at a constant 72 degrees on this cold and rainy day. Okay here you all go. 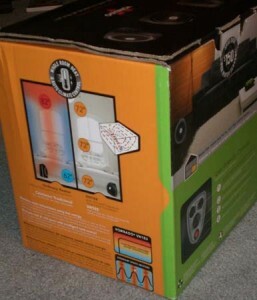 Because heating a room is easier than cooling it, I have tested this product in only one room. I tested the product in a closed off room in a basement. This room has two brand new energy-efficient windows, and two windows that are very old. It also has a brick fireplace in it that takes firewood, not gas. It is very rainy and cold and this room stays at a constant cold temperature even when the thermostat is set to 73 degrees. I turned on the product and waited. Using the “low” heat and “auto” setting for the fan, I was able to feel the room start to heat up in about 10 minutes. When I conducted this test earlier, I found that you can shave off a couple minutes by putting heat to “high” and increasing the temperature dial. Regardless my room has stayed at a nearly constant 72F throughout, with a minor 1 degree dip every once in a while depending on the location. Needless to say, I am toasty and do not need to stay glued to the heater to stay warm anymore. We did not have any problems with this unit in particular. Other users have reported to have this unit for and not experience any problems. Vornado honors this unit with a five year warranty. That is great for a fan. This product is constructed in the United States and is supplied there as well, so if you need parts or anything, know that it comes from there. Although we have no sound measuring equipment, I can tell you this product is pretty quiet. On low heat and when set to auto for the fan, you will hear a low volume “purr” come from the unit. On high heat and auto fan, you will hear it sound a little more like a fan set to low. It was all tolerable. Like all of their products, Vornado promises energy savings, and usually they deliver. Although you won’t save as much power as they claim, you will lower your bills. The VH103/VH102 promises up to $150 in energy savings. Vornado always tries to give you a great cord length. As you may know, devices that produce heat will usually have a short cord. Vornado actually gives you a long cord to work with. Is it as long as the cords they have for their fans? No. But that is to be expected. You will also notice that the plug does not have a ground. This will allow you to plug it in more places, but that also lowers the safety. All the same, I was not too worried because of how well built the product is and its safety features. Depending on the model, you will find the heaters usually in black. There are a few other options such as white, but they are very uncommon. 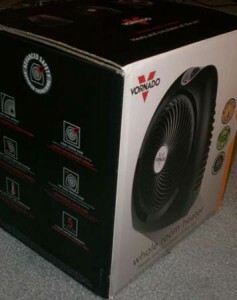 The Vornado VH103/VH102 impressed me a lot. There were little things to complain about here and I had to be nit-picky so that you all could get the full story. This product is well made, it is safe, has a great warranty, wonderful customer service, gives constant heat, and even has a long cord. I took off .25 due to the sound the product can make, the lack of the ground, and fan controls but I was very close to giving it a 5/5. Really other than that, the only thing I could see helping is even more energy efficiency. This entry was posted	on Tuesday, November 16th, 2010 at 10:44 PM	and is filed under . You can follow any responses to this entry through the RSS 2.0 feed. You can leave a response, or trackback from your own site. I am so glad you like your heater!